As you may know, with our tutorials, we strive to photograph and explain each and every step, to ensure your success in completing the project. In doing so, some tutorials can be quite long and contain many pages (particularly the more complicated projects). Printing numerous pages can use a lot of ink and paper, and we all know how expensive ink is nowadays. Fortunately, we have a few great tips to help you save time and money! First of all, our favorite way of viewing tutorials is by using a tablet (we both bought each other inexpensive tablets last year for Christmas and have been very happy with them). The cost of tablets keeps coming down and many are quite affordable now. You can easily view our PDF patterns on tablets (and smartphones) by using a PDF viewer app. There are numerous free PDF viewer apps to choose from, depending upon your device’s operating system (i.e. Android, iOS, Windows, etc.). We personally use Adobe Acrobat Reader on both our Windows and Android devices. It allows us to view our tutorials in full color and high resolution, and it has several great features. For instance; you can just swipe the screen to go to the next page, zoom in and out on a picture (so you can see it more detail), take it with you wherever you go (you don’t need wifi to view your downloaded content) – all without printing a single page! If you don’t already have a tablet, it may be the perfect gift to ask for this year! If you don’t have a tablet or smartphone to view our tutorials on, or if you’d just prefer to print out the tutorials, we have recently discovered a few ways to help you save a lot on ink and/or paper! The first way is how to print using less ink. The second way is to print multiple pages on a single side of paper (not the same as double sided). Detailed instructions for both are included below. 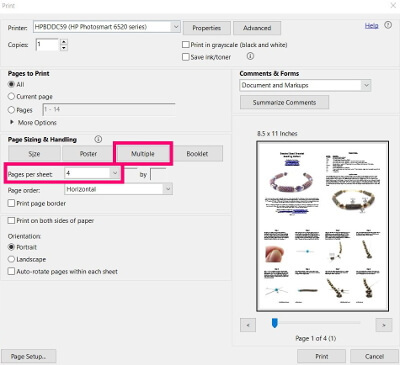 There is a very cool option on PDF viewers, such as the Adobe Acrobat Reader DC (free online), where you can print either (2) or (4) pages of a tutorial on a single piece of paper. We found that if you select (4) pages per (1) page, the text and pictures are still visible and it cuts your paper and ink cost by 75%! 1. Open the PDF tutorial in Adobe Acrobat Reader DC. Note: Again, if you’re using a different PDF viewer, these options may be in a different location. 2. Click File – Print to open the Print Options box. 3. 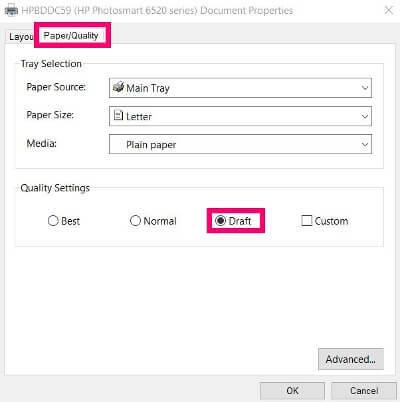 Located at the top of the Print Options box, click on “Properties” button, which is located next to the drop down to select which printer to use (screenshot below – click to enlarge). Then, proceed to step 4, which is below the image. 4. Then, select the Paper/Quality tab. 5. In the Quality Settings box, at the bottom of that screen, there is a radio button to select “Draft” (screenshot below – click to enlarge). Make sure you click “OK” to save this setting. 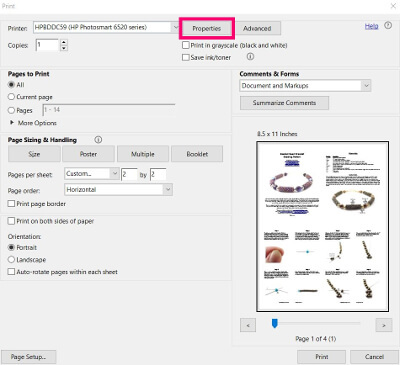 There is a very cool option on PDF viewers, such as the Adobe Acrobat Reader DC (free online), where you can print either (2) or (4) pages of a tutorial on a single piece of paper. We found that if you select (4) pages per (1) page, the text and pictures are still visible and it cuts your paper and ink cost by a whopping 75%! 1. Open the PDF tutorial in Adobe Acrobat Reader DC. Note: If you’re using a different PDF viewer, these options may be in a different location. 3. Under Page Sizing & Handling, there is an option to select “Multiple”, instead of “Size”, which is what’s typically selected (there is also an option for Poster and Booklet). 4. When you select “Multiple”, it then gives you the option to enter how many pages per sheet you’d like. For instance, if you enter (4), pages 1 – 4 of our tutorial will be sized down and fit onto just (1) page (see screenshot below – click to enlarge). Cool, right! If that’s too small for you, try just (2) pages per sheet. The page will be divided in half to fit pages 1 – 2 of our tutorial. Play around with the settings until you find what works for you. We hope this helps . . .